nevard_110331_brewhQ_store_IMG_9494_web, originally uploaded by nevardmedia. Brewhouse Quay Project: Whilst everything else has been going on, I've been working on a grainstore or something like that. This one is totally built from scratch unlike the other buildings. Anyway, whatever it is, it's now had a slap of paint. The stonework will be a little lighter and more honey coloured in due course. I tend to leave the final colouring to later when the groundwork is complete and also coloured. Some guttering and downpipes will be added in due course - thought I'd better get that bit in before the adenoidal armchair brigade point that out. nevard_110330_brewhQ_crane_IMG_9481_web, originally uploaded by nevardmedia. Brewhouse Quay Project: The other day I found this half complete Wills yard crane (KitsSS51). Originally it was intended for the little yard at on Catcott Burtle but it didn't quite work, but at last it has found a home on the brewery quayside. The 2 rather fetching wagons of GWR design are ancient and built from white metal kits. They must be at least 30 years old, if anybody knows of the manufacturer I'd love to know, not that want to build any more, it's just that I'm bound to be asked! Hail to the Ale! Each time I visit a model shop or show I must buy out the entire stock of wooden style ale casks, I'm going to needs literally hundreds of them. I'll gladly accept donations too (for a small fee of course)! This snap was taken under domestic lighting, when I finally construct the built in lighting I hope to minimise shadows on the backscene, as seen behind the chimney here. Meanwhile enjoy the snow like effect of yet to be painted cobbles - they won't be this colour for too much longer! Stop Press! 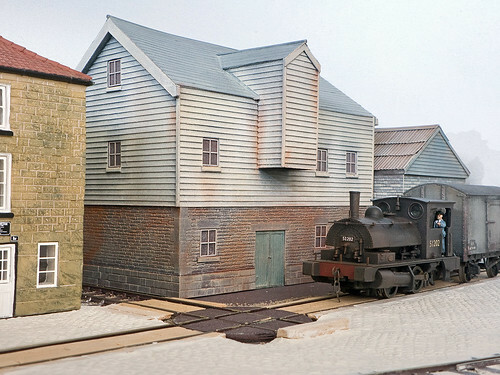 I'm hoping to be able to début Brewhouse Quay at Model Rail Live 17 & 18 September. I'll confirm this shortly. nevard_110327_brewhQ_IMG_9474_web, originally uploaded by nevardmedia. Here we have an overall view of the project so far. 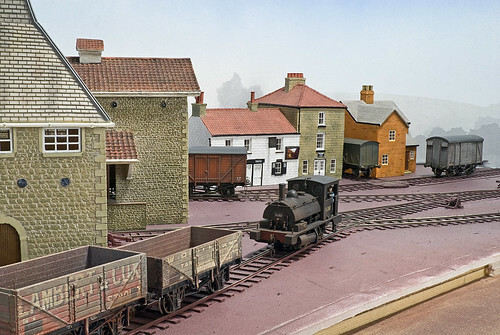 Before too long some warehousing will appear to the right of the wagon turntable. The line off the wagon turntable will also disappear into a building of some sort with opening doors to hide its exit through the backscene. To the left of the pub there will be another store, with an aerial walkway linking to the large stone building to the left of the van. This will also help to provide a scenic break over the far line. Just now I also planted a small crane onto the quayside. The siding at the far left will supply the coal store which will be built on the quay and in front of the brewery building on the extreme left. nevard_110327_brewhQ_track_IMG_9467_web, originally uploaded by nevardmedia. I wasn't totally happy with yesterday morning's depiction of sets or cobbles, the effect was too coarse and somewhat over scale. 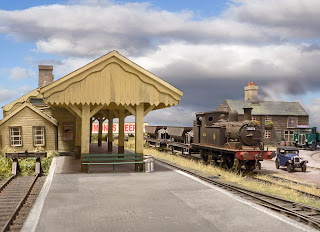 At least though if ever I model O gauge it's a techniques that can be used there. By chance I was trying to find a pen to take a message from a caller, and after I put the phone down had one of those eureka moments using the ball point pen with the writing bit removed to stamp the little stones into the squidgy DAS modelling clay - the shot above showing of the revised effect. Having done the whole front, I'm now working towards the rear of the layout. The natural window light is very acute here giving a somewhat over-accentuated effect that will not be seen to such a degree under the layout's own built in lighting. Painting in due course will kick off with a mix of black, grey and red aerosol primers, the stones will then be drying brushed using matt enamel, selecting beiges and greys as used on this stone building here. I prefer to start dark in colour and dry bush on the lighter tones rather than flooding dull paint washes over light colours which frequently lacks control and gives unpredictable results. nevard_110325_brewhQ_track_IMG_9461_web, originally uploaded by nevardmedia. Due to illness in the family (temporary I hasten to add) I'm rather housebound at the moment playing nursy, pharmacist, bottle washer, human zimmer frame, maid and so on; however between these chores I'm able to dedicate a little more than the average time to getting Brewhouse Quay up and running. Yesterday saw the ballasting of the track and a start at reproducing the sets aka cobbles on the quayside. In the past for such, I've always use Humbrol Air Clay, but my local shop now stocks DAS instead. I must say that I'm very impressed, mainly because it doesn't crack when setting, thus saving valuable touch-up time. I tend also to ballast the areas that will have the modelling clay applied, the ballast making a key to hold the clay in place. 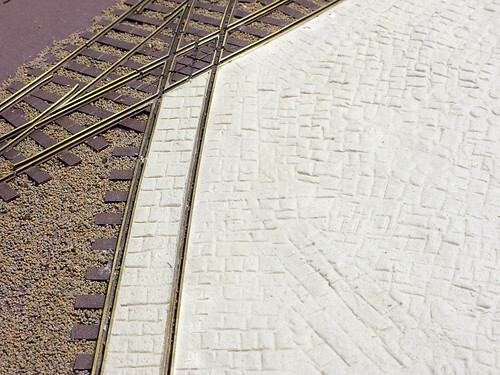 It also makes it easier to apply between the sleepers to represent fine clinker which tended to be used on British sidings rather than course ballast - the siding in the foreground here representing the technique well. There is a huge area to do, so rather than grind out the individual slabs which would take forever and probably go unnoticed, I'm simply texturing the clay before it sets with a screwdriver and any other suitable objects to had to give lots of variety. When finally coloured it should give the desired effect from a normal viewing distance. And anyway, it will be covered with miniature ale casks and coal for the brewhouse furnace to heat the boiling copper. nevard_110324_brewhouseQ_DSC_1893_web, originally uploaded by nevardmedia. This afternoon saw the painting of the track in preparation for ballasting and embedding in cobbles. For this I misted on red, grey and black primers. The backscene has seen some rudimentary colouring using a technique I've wanted to try out for some time using spray paints and paper masks to create a high pressure hazy summer day effect. My pet hate is tatty badly finished overstated backscenes, this technique is quite the opposite both in finish and effect. 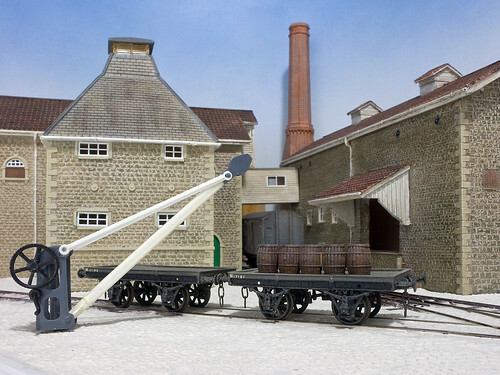 Look, a working wagon turntable for Brewhouse Quay! The is a test for a forthcoming currently top secret kit which will be revealed in due course in Model Rail. The multi media construction is of etched nickel-silver, plastic and thin ply, and is the result of about 2 hours work. Operation in my case is a simple lever under the baseboard which allows it to twist through the 90 or so degrees required. 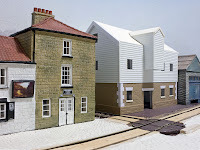 Once the layout is finished I'm thinking along the lines of a miniature rope, capstan and chain system for pulling the wagon out of the siding between the two buildings which disappears off behind the backscene to another part of the brewery. The rather fetching building is the background is the lovely Bachmann Scenecraft limited edition Birch Hall Inn based on the real CAMRA award winning pub at Beck Hole in North Yorkshire. 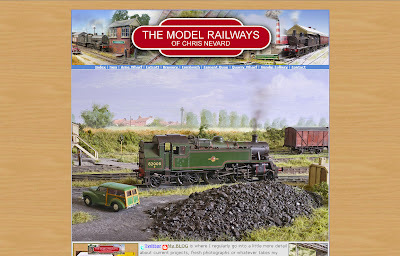 This cracking model can be purchased ready to have a miniature pint in from The Trafford Model Centre. 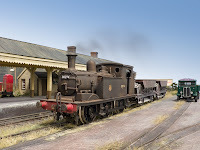 Update 26/3/11, If you want to find out more about wagon turntables that were very much a feature of industrial railways follow this excellent link. 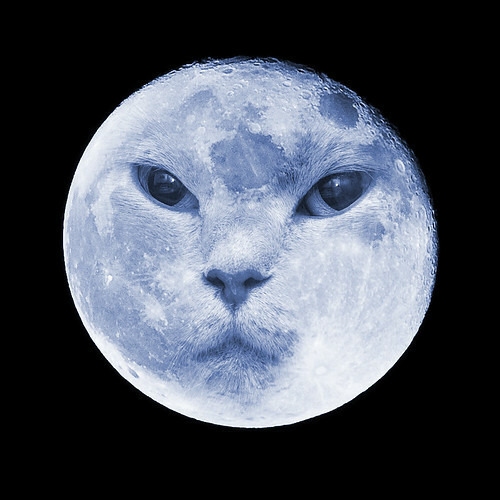 110321_supermoon_DSC_1695_cat_web, originally uploaded by nevardmedia. Unless you've been living on the moon, you'll no doubt know about how wonderful our nearest neighbour has been looking with the recent clear nights. 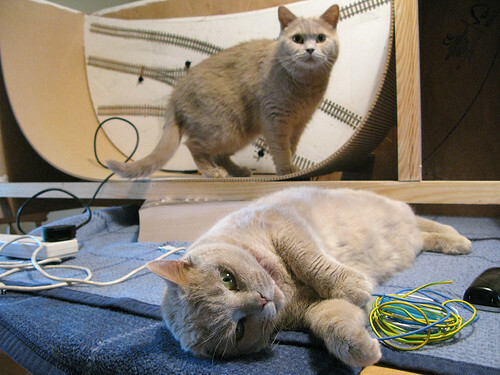 Here we have Saffy our British Short Hair blended in with the much photographed 'Supermoon' of 21 March 2011. The moon was shot through a 45 year old Soligor 400mm telephoto lens. For dog lovers here is the shot of the moon without Saffy. And here is a version with trains. I've had several emails over the last day or so wondering where all my model railway photographs have gone at www.nevardmedia5.fotopic.net . It would appear that Fotopic.net has again dropped into the pond without a life jacket. When this last happened a year or two ago, I decided to set up a duplicate site on Flickr 'just in case'. It would appear that my 'disaster recovery' was a worthwhile plan, and I have just spent the last 90 mins of so updating my portal at www.nevard.com to reflect the new links. Service back to normal, though I do admit to preferring the old Fotopic interface and look - still, life goes on and we cannot spend all our spare time worrying about the web, there's real life to be getting on with. Wiring has commenced on Brewhouse Quay, working from right to left, the first 2 points are operational as this video demonstrates. The performance is very smooth, any jerkiness here being the YouTube compression, processing and should not be an indication of actually running qualities. I'm not using under layout point motors this time, but using Caboose Hobbies Ground Throws as seen here in the short video. Whilst they are American in style, they weren't unfamiliar in UK industrial locations. Frog polarity switching is under the baseboard using a simple switch from 0.75 brass wire extending from the turnout blade tie which I'll cover in due course.To find out more about the manual point throws, read Nigel Burkin's excellent feature in the April 2010 Model Rail Mag. nevard_110303_brewhouse_IMG_9322_web, originally uploaded by nevardmedia. Btw, the first loco ran under its own power shortly after this snap was taken - using electricity, not thrown at one of the cats should anyone ask! My workbench depends on what I'm doing, so it tends to be set up all over the place depending on current circumstance. 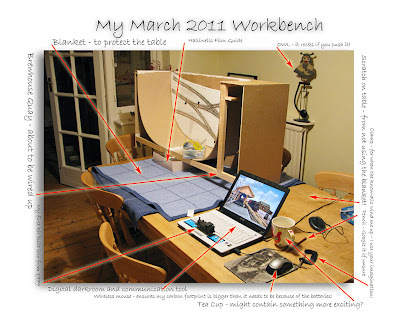 Here is the mobile workbench as seen right now at the beginning of the month of March. Click on the image to reveal a bigger view and to be able to read the rather hastily added pointers of what is where. Old tosh: Templecombe's familiar ex-LSWR G6 No. 30274 is captured here under stormy looking skies at Combwich on one of its very rare outings from shunting in Templecombe Upper Good Yard. Click on the photos to enlarge. 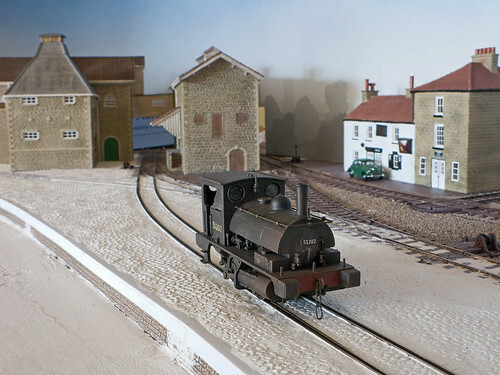 Fact: Here's my very first white metal kit in the form of a Wills LSWR G6. I recall at the time buying a Wrenn SECR R1 0-6-0 for the chassis. In 1979 when I built this kit, the missing centre flange on the heavy duty chassis was reasonably acceptable, with many ready to run steam locos from UK manufacturers featuring such. Combwich, the layout used as a backdrop here was started at around the same time that this loco was built, to me though it still sort of feels like a new layout, though some of the techniques like blobs of solder to depict rail chairs has been surpassed to some degree. The dash here and there with the Noch Grasmaster is a good way to bring the scenic aspect of older layouts back up to date easily.